Photo courtesy of WYFF4 Greenville, SC. No, the distillery isn’t on fire. It just keeps grabbing award after award after award. A total of 17 to date. That’s a lotta gold for a little white lightning brand. 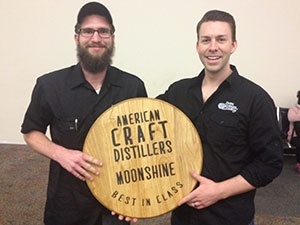 If you haven’t heard of Dark Corner Distillery yet, you’re about to — because they just took home a gold medal and Best in Class award in Denver at the American Craft Distillers Association spirits competition. Recently Dark Corner also won a gold medal from the Beverage Tasting Institute. What makes Dark Corner Distillery’s Moonshine so buzz worthy (excuse the pun)? They say it’s their unique blend of corn, red wheat and barley using time-honored techniques passed down from America’s early settlers. They hand-mash and twice-distill each batch, which many shineficionados claim delivers a remarkably smooth finish. Even at 100 proof. Head on over to their site to learn more about ’em. Buy a bottle of Dark Corner Distillery Moonshine and support the craft movement. And read up on their “Heritage” page, which in my semi-expert opinion, is one of the better historic write-ups about the Celtic immigrants who shined in our nation’s early days. Hats off to these fellas for doin’ it damn right. All I have to say is, damn. This is gorgeous. No matter what moonshine you prefer to drink, this oughta make you proud to drink it. If not, you may want to have your pulse checked. Junior Johnson’s Midnight Moon has a gorgeously redesigned website that at long last features a “dry goods” store to buy MM merch. But what I’m loving most about the new dubs is the recipes section. Just a few Holiday cocktail recipes you’ll find on the all-new Midnight Moon website. It’s conveniently filterable by flavor or by season. And if I counted correctly, serves up 46 — yes, 46 — lip smacking, vision blurring moonshine cocktail drinks. In tooling around the web for years looking for the latest and greatest ways to drink moonshine, this is by far the most extensive collection of great recipes I’ve seen. Kudos, Midnight Moon. You have officially given me a reason to drink even more during the Holidays. Several months back I wrote about the 19th century Appalachian moonshiner Buck O’Hairen, whose bio surfaced after a one-of-a-kind firsthand journal was discovered and put online. I decided to write about him not only because I had never heard of the dude in all my years of talking ‘shine, but because he just seemed like one odd character. O’Hairen was a renowned distiller as well as a musician, poet, entrepreneur, and even owned a pet raccoon named Trigger. Turns out I’m not the only one who was intrigued by old Buck. 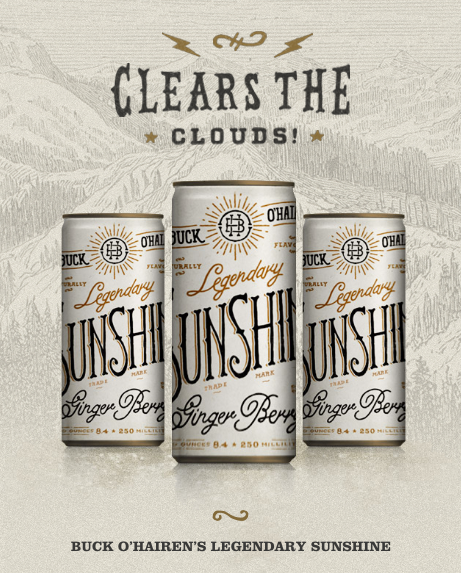 A company called Sunshine Beverages, LLC out of Winston-Salem, North Carolina recently launched a beverage called Buck O’Hairen’s Legendary Sunshine. Their drink is “inspired” by the 1875 recipe O’Hairen concocted…a drink called Sunshine, which was a non-alcoholic mash of fruit, vegetable and root juices that he sold from a roadside wagon. While the modern-day version of Buck O’Hairen’s Sunshine seems to be more of a contemporary pick-me-up refreshment than a simple “mash” from yesteryear, reality is it probably tastes a helluva lot better. It rocks some natural ginger, blackberry, stevia and artwork on the packaging that a man of Buck’s culture would have appreciated. Most of the reviews I’ve been reading have been positive. I may just have to try a case for myself. The holidays are coming around, and who knows when I’ll need something to clear the clouds. Technically, it’s a beer. But since real moon dust is one of the ingredients, I’d like to think of it as a really bizarre take on moonshine. Delaware-based brewery Dogfish Head developed the brew, appropriately named “Celest-jewel-ale,” to celebrate the autumnal equinox last month. The brewery said that the moon dust is made up mainly of minerals and salt, which help along the fermentation process and give it a unique, earthy complexity. 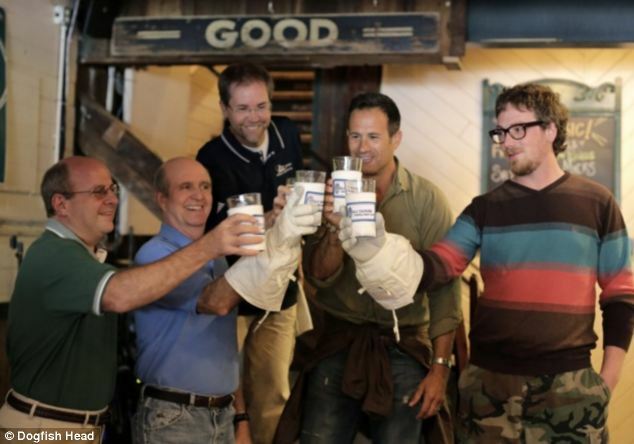 Cheers to Dogfish Head on making beer with the moon.